Mostly about film, TV and 80s adventure gamebooks. New posts every Sunday. 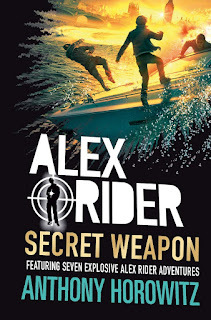 Some eighteen and a half years since he first burst into the world of young adult novels, and eight years and three books after author Anthony Horowitz categorically declared he was done with the series and there definitely wouldn't be any more, teenage superspy Alex Rider is still going strong, with Secret Weapon the twelfth and latest instalment in the series. What we have here is a slightly different proposition to the norm - a collection of short stories, some of which have been previously published in newspapers or online, and some of which are completely new for this anthology. This release is more significant than it first appears - it was working on this collection that convinced Horowitz he might have been too hasty in ending the series with Scorpia Rising in 2011 and resulted in its revival two years ago with Never Say Die, with at least two more full-length novels to come before the series really is over for good (the first of which, Nightshade, will be out early next year). 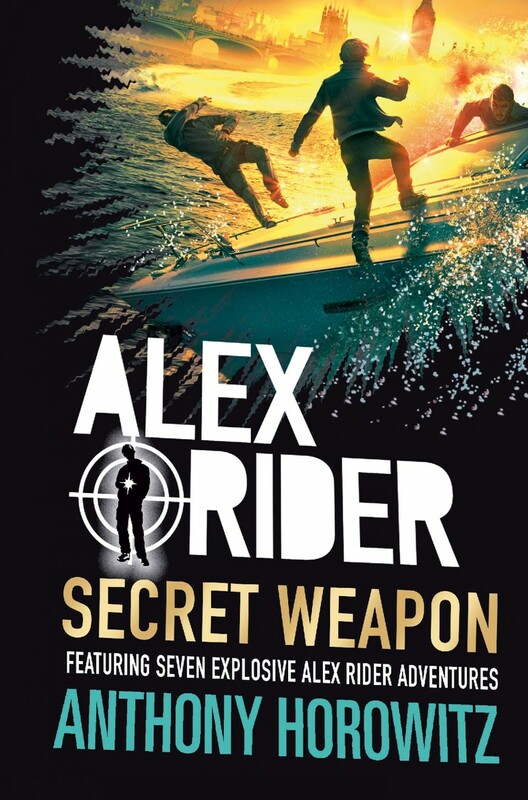 But how do the seven bite-sized instalments contained in Secret Weapon measure up? 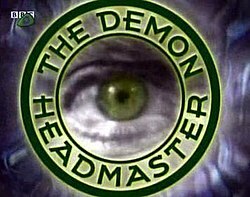 Q: Who was the first actor to play the Demon Headmaster for the BBC? You may not be particularly surprised to learn that the A to that particular Q is not Terrence Hardiman. Some 6 years before the CBBC series, the first two books were adapted for Radio 5 Live by Jim Eldridge in October 1990, in a format perhaps coincidentally very similar to how the first TV series would later handle them: a 4x25 series, with the eponymous first book covered in the first two episodes and The Prime Minister's Brain in the second. The only difference is that the TV series gave each book an extra episode; perhaps as a consequence, the characters of Ingrid, Lloyd and Mandy are all merged into Ingrid in the radio version. Anyway, the cast for the radio version was Edward de Souza as the Headmaster and Lucy Speed as Dinah. Nearly every Robot Wars fight ever filmed was edited down in some way. (I have covered some of the more glaring examples in the past.) No fight that lasted the whole 5 minutes made it to air in its entirety, with some lasting less than 2 minutes once the editor had got their hands on it; I believe the record for least cut full-length battle is the Series 6 Grand Final, which only had about 20 seconds trimmed from it. Usually, however, the edit was done well enough that it wasn't too obvious. Apart from this one. There are three mistakes worth noting here, and for some reason I find the biggest one really, really funny, which is mostly why it's getting covered. For the record: I defined "recurring character" as someone appearing in at least two different series - disqualifying a large number of one-series characters who appear in multiple episodes, including Elena (who appears in all 6 episodes of Series 6), Zahra (all but one episode of Series 7) and Megan (all but one episode of Series 9). 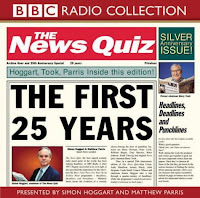 "Tonight on BBC One, Ian Hislop and Paul Merton return in 'Have I Ripped Off the News Quiz for You'..."
You are more likely than not aware that Have I Got News for You is a television adaptation of Radio 4's own long-running news quiz, The News Quiz. It is far from unique in this regard, although it has had notably more success than other panel games that made the leap from sound to screen. I thought I'd send you off to another part of the Internet I find amusing today. Except the particular website no longer exists, having gone offline a few years ago. But fear not! With the help of the Internet Archive Wayback Machine, I can still send you there. (There might be the occasional broken image, and the original pages had sound which it seems the Archive can't reproduce, but everything should still work fine and the games should be perfectly playable.) So we can all still enjoy the Stickville Murder Mysteries, a quite amusing series of browser-based detective games set in an occasionally quite surreal world of limited art, whilst also hopefully learning an important lesson about the importance of keeping archives of the internet. 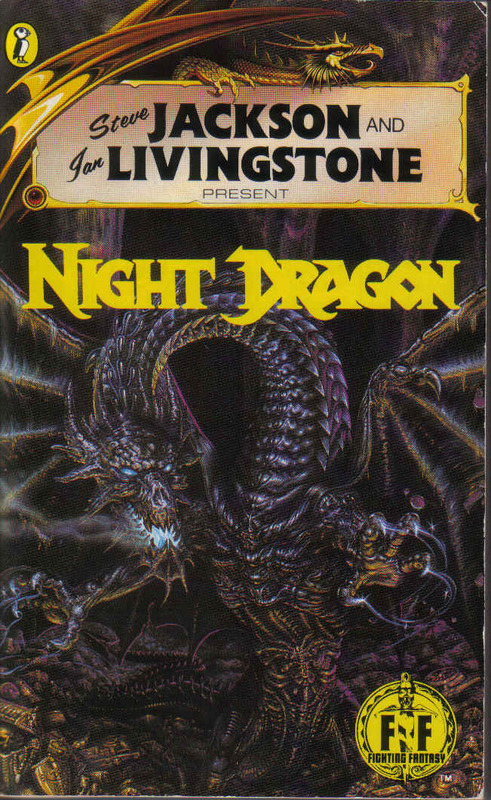 Where Do Unpublished Gamebooks Go? 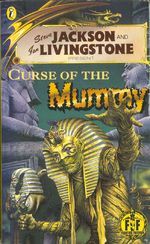 26 October, 1995: Curse of the Mummy, the fifty-ninth entry in the Fighting Fantasy series, is published by Puffin. It is also to be the last FF book Puffin will ever release, although nobody knew that at the time. Well, there's probably plenty of reasons why not, but go on anyway. Or if you enjoyed anything I've written here - and there really is no accounting for taste - why not consider buying me a coffee?